A comprehensive list of this years most exquisite and expensive celeb homes. If you can manage to scrape together around a couple hundred million dollars somehow, consider this as a list of potential winter getaways. If you’re like the rest of us, here’s is a list of homes that could inspire you or just leave you violently jealous. Yes, we are talking about celebrity homes—those outlandishly expensive and lavish structures that never cease to amaze us. Here is a compiled a list of the top 10 celebrity homes of 2017. What are you waiting for? The Maroon 5 vocalist, who also serves as a judge on The Voice, put his New York based SoHo loft on the market in September. That was a good decision, because it had only 1 bedroom. Adam had successfully converted the 2nd and 3rd bedrooms into an open space in 2014. This sprawling 2,800-square-foot property was put up for $5.4 million and is located on an attractive cobblestone street, this SoHo cast-iron edifice dates back to the 1900s. The loft comprises a 60-foot exquisite living room that opens to a beautiful kitchen which is made up of stainless steel appliances and black granite. Designed by architect Antti Lovag, the Bubble Palace in France was constructed between 1976 and 1990. It was purchased by Pierre Cardin in the early 1990s as his vacation home. He was attracted to the property’s round shapes, which he often compared to the sensuality of a woman’s body. The market price for the palace recently declined to $335 million from $456 million. The connecting bubbles of the palace represent each room in this expansive 10-bedroom house, which extends over 6 levels on 1.75 acres on the famous Theoule-sur-Mer cliffs and offers spectacular views of the Mediterranean. In 1967 Frank Sinatra purchased this brilliant getaway home covering 5 acres 4,300 feet above the Coachella Valley and Palm Springs. This home has a market value of $3.9 million. The ten acre complex comprises 3 buildings and was erected using a rustic style along with warm woods, it has 7 stone fireplaces, 2 kitchens, living and dining rooms, 5 bedrooms, and 5 bathrooms. It also has guest quarters with 2 bedrooms, 1 living room, a bath, and a full kitchen. The pool house is exquisite with a relaxation room that features a stone fireplace, 2 saunas, 2 bathrooms, and a mini-kitchen. To top it all off, there is parking space for about 25 cars, and the property comes with a helipad. The gated house purchased by Elvis Presley for $400,000 on his marriage is a lot different from the sophisticated and slick home it is today. The 5,400-square-foot house consists of 4 bedrooms, 5 bathrooms, a motor court, an attached guest house and a pool terrace. The house covers a huge 1.18 acres on a famous street called Billionaires Row. The home has a market worth of $30 million now. This house with a design that was meant to replicate the curves of the nearby mountainsides has a market value of $3.25 million. The expansive 2,850-square-foot house, rests on 1 acre of desert over Palm Canyon and comprises 3 bedrooms, 3 baths, a classic living room fireplace meant to bring friends and families close together, 1 media room, 2 home offices with great cabinetry, a uniquely curved kitchen, a crescent pool deck that can be seen from inside through expensive glass walls. In 1998, Prince purchased this dazzling villa in Spain. It is located in the hills of El Paraiso, west of Marbella, and affords spectacular views of the valley, mountains, sea, and a golf course. The price for this 7,535-square-foot villa has experienced a slight decline from $5.99 to $5.2 million.The property is located on 1.45 subtropical walled acres; it has terraces which cover 2,583 square feet and 6 huge bedroom suites (2 masters). The grand master encompasses 2 levels. 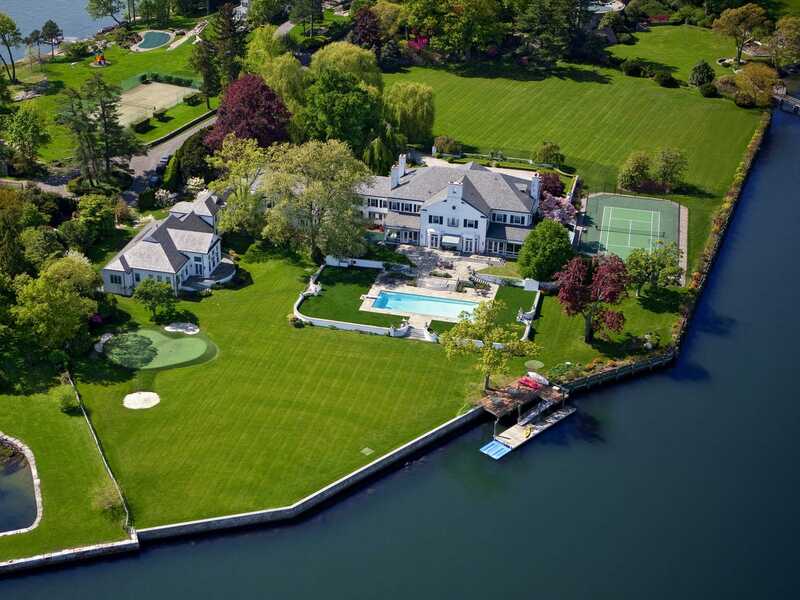 The 5.8-acre house nestled along a peninsula in Greenwich, Connecticut was bought by Donald Trump for almost $4 million in 1984. The mansion was put up for sale for a whopping $54 million, but has recently been off the market. The house also has a home theater, multiple patios and terraces, tennis courts, putting green and 3 well-equipped staff apartments. Perched nicely on top of the Bristol Tower, a famous skyscraper, located at the entrance to Key Biscayne, this rambling 10,000-square-foot Miami penthouse consists of 5 bedrooms, along with an additional 5,000 square feet covering several terraces with a second-level kitchen and a rooftop swimming pool. Williams bought this penthouse for $12.52 million in 2007, later transforming it into a lavish mogul palace with his elaborate furniture and art collection. 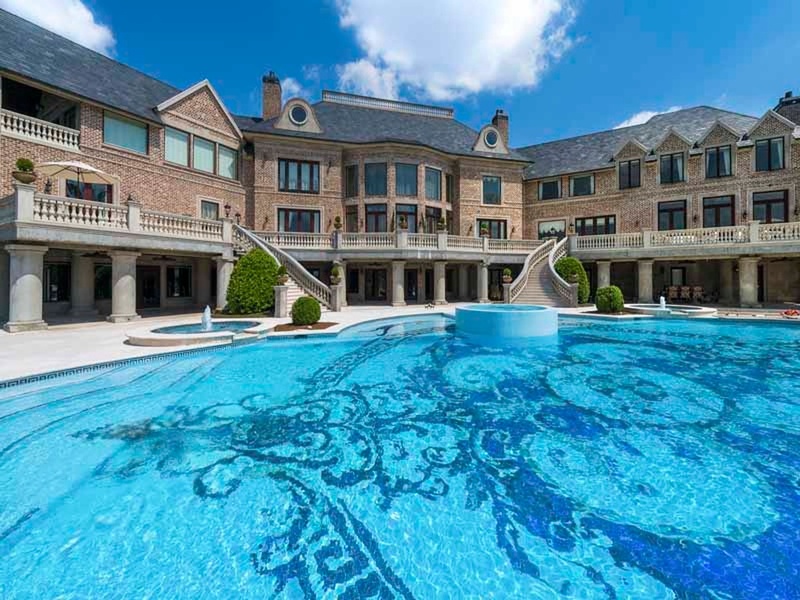 Perched very high above the beautiful Chattahoochee River, this colossal 34,688-square-foot house (yes it is that huge) has 7 bedrooms and 14 bathrooms, an infinity pool, a gigantic 2-story library a well-lit tennis court along with a 2-story garage, a spa, a gym, hobby house, one theater and a catering kitchen and an underground ballroom. The mansion boasts informal and formal gardens, estate generator, and caretaker’s suite, with a presidential-level security system and 2 secured and gated residential entrances. 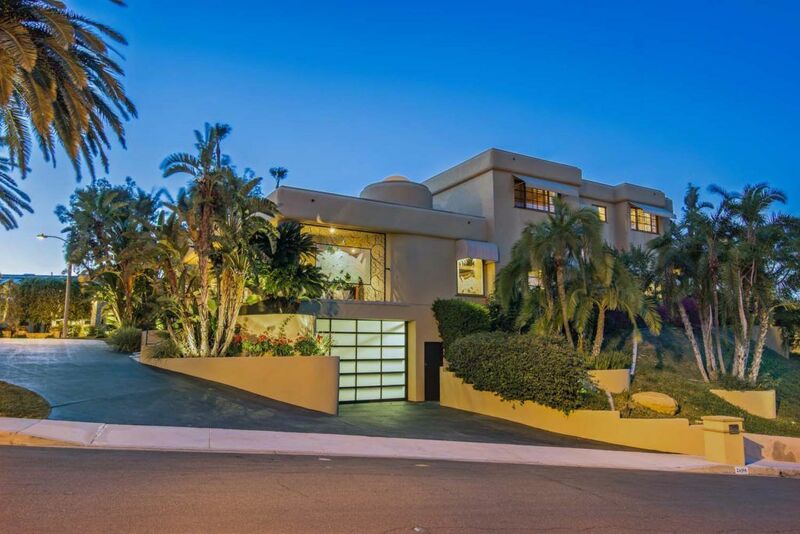 The favorite vacation home of Kirk Douglas is tucked away in the historic and momentous Old Las Palmas neighborhood and has an asking price of $3.45 million. The huge 4,000-square-foot house, designed by Donald Wexler has the purity of Wexler’s unique design with its flagstone cypress foyer, glass walls, and beamed ceilings. The wide floor plan of the house includes formal sitting and dining areas, cozy fireside seating, a mirrored wet bar, updated bathrooms, and a remodeled kitchen.